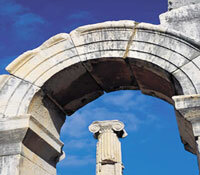 Sirince Village - Browse among the tented stalls and shops, view the Byzantine church. Sample the local wine and stop for a cup of Turkish coffee. After your coffee, a local fortune teller will predict your future by reading the coffee grounds in your cup. From Kusadasi, you travel north to St. John's Basilica, passing the Byzantine fortress at Selcuk and the ruins of the Temple of Artemis. Continue up to the upper gate of Ephesus then to the Sirince Village. By the end of touring the village, return to Kusadasi. - Guests must be able to walk approximately 0.5 miles over uneven and cobblestone surfaces, inclines, hills and 10 - 30 steps in Sirince Village.